Scribbles In the Sand........... My Desert Diary: By plane or by car? 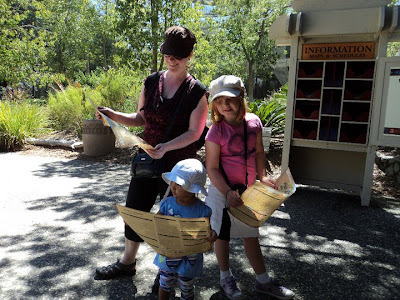 Last week my good friend, Victoria, brought Naomi and I to the San Diego Wild Animal Park (well, that's what I call it, they've changed the name to safari park or something that I can't remember). Here I am with the kids puzzling over the map. Despite the heat we had a really nice time exploring the park. My friend was excited, but agitated most of the day as she'd just booked a flight to visit a friend this summer. Unfortunately she's terrified of flying, but not as terrified as her friend is, so she's the one braving the trip. I tried to console her with the same old adages about how it's safer than driving to the supermarket. I don't think it helped very much. As if on cue to back up my claims our other good friends here in San Diego were in a collision just a couple days later. Their car was hit by a young woman who plowed through the red light as she texted on her cell phone. Their car was totaled and two out of three of them left the scene in an ambulance. We went to visit them on Saturday and they will be okay after they have some time to heal. In conclusion idiots are everywhere. The End. I hope your pal had a safe, assuring flight...apprehension pangs trigger thoughts of pessimism at times, when courage sneaks low...But, I hope know she's capable of even flying on her own without any fear..wish those in the hospital have recuperated by now too..tc..have fun as always! The list is too long and the fun never ends here. Plus, with the state being broke, who knows, they might start shutting these places down.